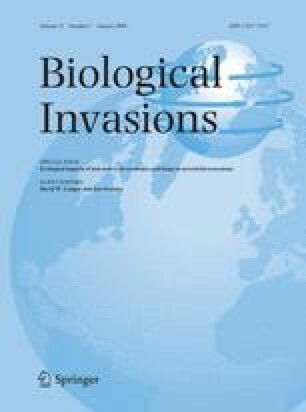 A literature survey identified 403 primary research publications that investigated the ecological effects of invasive alien insects and/or the mechanisms underlying these effects. The majority of these studies were published in the last 8 years and nearly two-thirds were carried out in North America. These publications concerned 72 invasive insect species, of which two ant species, Solenopsis invicta and Linepithema humile, accounted for 18% and 14% of the studies, respectively. Most publications investigated effects on native biodiversity at population or community level. Genetic effects and, to a lesser extent, effects on ecosystem services and processes were rarely explored. We review the effects caused by different insect invaders according to: their ecosystem roles, i.e. herbivores, predators, parasites, parasitoids and pollinators; the level of biological organisation at which they occur; and the direct and indirect mechanisms underlying these effects. The best documented effects occur in invasive ants, Eurasian forest herbivores invasive in North America, and honeybees. Impacts may occur through simple trophic interactions such as herbivory, predation or parasitism. Alien species may also affect native species and communities through more complex mechanisms such as competition for resources, disease transmission, apparent competition, or pollination disruption, among others. Finally, some invasive insects, particularly forest herbivores and ants, are known to affect ecosystem processes through cascading effects. We identify biases and gaps in our knowledge of ecological effects of invasive insects and suggest further opportunities for research. The online version of this article (doi: 10.1007/s10530-008-9318-y) contains supplementary material, which is available to authorized users. We thank Ecki Brockerhoff, Wolfgang Rabitsch and an anonymous reviewer for their useful comments on the manuscript, and Jon Sweeney and Dave Langor for having invited us to participate in this special issue. We also thank all the colleagues who provided assistance in literature search and acknowledge support from the European Commission Framework Programme 6 via the Integrated Project ALARM (Assessing LArge scale environmental Risks for biodiversity with tested Methods; GOCE-CT-2003-506675; www.alarmproject.net; Settele et al. (2005)).